You are here: Home / WalkIn Tubs / Will It Fit? By following the simple steps below you can save thousands of dollars over companies that sell their Walk-In Bathtubs through costly showrooms or fancy high-priced color brochures and postage. These expensive marketing tactics ultimately end up being paid for by YOU. At Walkin Tubs Of America™ we make it easy for you to buy our Walk-In Bathtubs online, shipped direct from the factory to your front door. The end result is that you get a superior product at a lower price. As LEADERS in the industry, Walkin Tubs Of America™ wants to make sure that you select the best Walk-In Bathtub for your personal needs. In preparation for ordering, we not only want to be sure that you choose the right tub for yourself, we also want to make sure that it will properly fit into the configuration of your bathroom. To do so, we have developed a simple 5-STEP PROCESS for you to follow. You will need a tape measure, a pen and a piece of paper. The entire process takes only a few minutes to complete. STEP 1) MEASURE THE LENGTH AND WIDTH OF YOUR EXISTING BATHTUB (or shower). Your new Walk-In Bathtub will usually take the place of this existing bathtub (or shower). Also, note if there are any windows directly above any part of the bathtub. If so, measure the distance from the floor of the bathtub to the BOTTOM of the window. Write down all measurements. STEP 2) MEASURE THE WIDTH OF EACH DOOR (and each hallway) leading from your front or back entrance door of your home, through every door and hallway leading to the bathroom where it will be installed. Write down only the width of each one that is 30” or less (unless you are specifically interested in the wider widths on some of the models that require more than that to get through). Any regular door width 28” or more is usually sufficient to allow most of our Walk-In Tubs entry into your bathroom. (Note: For certain bathtub models, this may require a temporary door assembly removal and replacement of your 28” doors. In some rare cases it may require widening the doorway and replacing the door with a minimum of 30″ or wider door). Note: Common door widths are usually 24”, 28”, 30”, 32” or 36”. They may ultimately measure up to 1⁄2 inch shy of any of these measurements. If you have a 24” door width, by removing the door assembly you can get MOST of our models that have a 26″ width through that opening. Additionally, you may choose to widen the 24″ door to a 28″ or 36″ door, or wider, if it is feasible. This may also bring your door width up to current building codes and allow clearance for any walkers or wheelchairs. Widening a 24″ door can allow many models in our line of Walk-In Bathtubs to fit through your doorway. STEP 3) DETERMINE WHICH OF THE DRAWINGS BELOW BEST DESCRIBES THE CONFIGURATION OF YOUR BATHROOM. 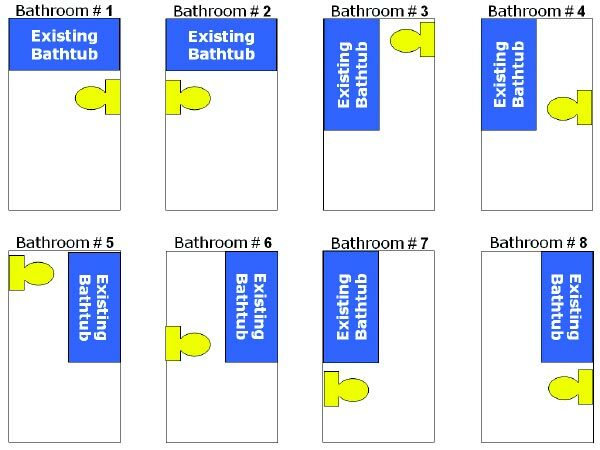 Page 3 or 3 contains some common configurations of existing bathtubs in relationship to the placement of the commode (or sink). Simply determine which of the 8 bathroom drawings best describes the configuration of your bathroom, and write down that number. One of the reasons to include this step is that we need to determine whether to provide you with a LEFT mounted door or a RIGHT mounted door on the face of the tub, (see page 3 of 3 for pictures of LEFT and RIGHT mounted doors.) It is ALWAYS best to put the tub’s door where you have the most space available for easiest ingress and egress. By selecting the correct configuration of your existing bathroom below, we can provide you with the proper door mount side (LEFT or RIGHT) specifically for you. STEP 4) DETERMINE WHICH WALL OF YOUR EXISTING BATHTUB (or shower) HAS THE FIXTURES (i.e. knobs, faucet, spout, shower-head). Determine this by facing the long end (length) of your bathtub standing outside of it. You will find your existing fixtures on either the “left wall”, “right wall” or “back wall” of the bathtub. Based on your answers to Steps #2, #3 and #4 we can ascertain if a “reversal of plumbing” will be needed when the Walk-In Bathtub is installed. About 40% of the time, a “reversal of plumbing” is needed. With many of our models reversals can be done simply and easily under the bathtub, between the bathroom floor and the bathtub floor. STEP 5) CALL US WITH YOUR RESULTS. Simply call the toll-free telephone number below to get your results evaluated. Additionally, our courteous staff of professionals can provide you with any help you may need including options, prices and expected delivery dates.